First of all, I want to thank Oni Press for giving me a review copy of this book! As you can see from the brief synopsis supplied by Goodreads, Play Ball is a coming-of-age sports story about a girl who wants to play in a sport dominated by males. Dash sure knows the difference between softball and baseball, and she refuses to play the “watered-down version” of baseball, so she decides to try out in her high school baseball team. This decision caused a ruckus within the school administrative system – baseball has always been a men’s sport. It wasn’t specified in the rules because it was inherently known and accepted by everyone. Because of Dash’s stubborn determination, though, she manages to get into the team. What I really liked about Play Ball was how it wasn’t all centered on Brody. The characterization was well thought out. Everybody has a different personality to them, and their reactions to things are fairly natural and realistic. Dashiell, for her part, has to contend with several factors before she could participate into the team: her jealous sister, the sardonic softball team, a disgruntled teammate, and the classic status quo. Each of the characters was able to grow, and I appreciated this very much. Though some parts were cliched and predictable, the plot was not an issue for me at all because I enjoyed the story. I am so curious to what happens after the book ends! Maybe it’s because I have a soft spot for books that have really cool heroines, and Play Ball just fits into that category, but I liked this book. Girls who excel in sports rock! I really find it cool how Dash is really against playing softball for the reason that it is not baseball. The girl really knows what she wants. Not many people can tell the difference (to be honest, I couldn’t remember much difference myself except that the balls used are different, but hey, it’s a start). Play Ball will be released on April 25, 2012! It is written by Nunzio DeFilippis and Christina Weir, the team who wrote The Avalon Chronicles and Amazing Agent Luna, and drawn by newcomer Jackie Lewis. You don’t have to be a baseball fan to enjoy this either. I recommend you read it! It’s definitely something you’d enjoy. Courtney Crumrin and the Night Things is filled with dark humor and wild characters that I did not expect from a series that seemed to be aimed to a younger audience. I liked it, however, and for a first volume, it kept me engaged and wanting more. Courtney Crumrin, its titular heroine, just moved with her parents to her Uncle Aloysius’s house. I think mansion would fit better, but it is obvious that it has seen better days. It is now dark, spooky, and had all the looks of a haunted house. Courtney finds herself having a hard time fitting in anywhere for the days and weeks that follow, even in her own home. However, she finds out more about herself – she is in fact a witch. Uncle Aloysius is considered an oddball by many, and Courtney soon finds his strange but interesting collection of magic books. From here, she discovers a world far from anything she has ever imagined. Here she meets goblins, changelings, talking animals, faery queens, and a whole lot more. I am extremely fond of stories based on folk tales and paranormal mythology, and this is no exception. I really liked how writer/artist Ted Naifeh illustrated everything, and I enjoyed both the colored and black and white panes. Courtney Crumrin is filled with dark humor and wild characters – it is not unusual for children to be eaten by goblins, or mortal babies sold in the underworld market while a changeling cries for milk in its place. The fact that the author is unapologetic for these horrible occurrences, as if it really is a fact of life for the characters (and indeed it is, whether they are aware of it or not) made me love this. For a first volume in a series, it did not fail to engage me, and I would not pass up a chance to read more of Courtney Crumrin. This series is especially recommended for people who love fairy tales and myths. People who love paranormal/supernatural cases in a graphic novel would find this fun to read. Despite looking like something suited for middle grade readers, I think this would suit young adults better. 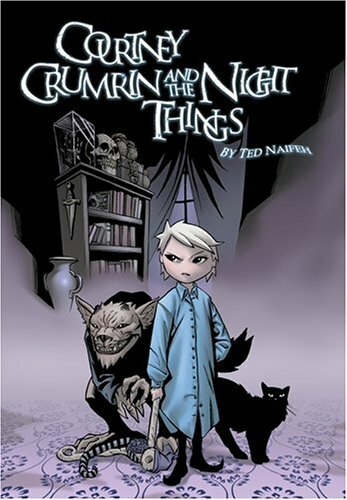 The full color hardcover edition of Courtney Crumrin and the Night Things will be released on April 11, 2012.